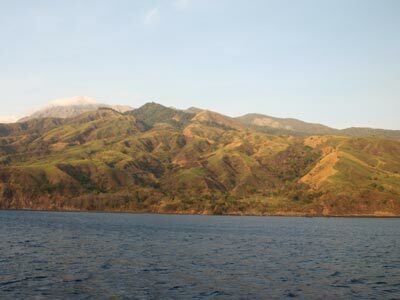 Sangeang Island (Pulau Sangeang) is located off the north-eastern corner of Sumbawa Island. It is home to an active volcano called Sangeang Api. The volcano is the almost perfect conical shape, and as such, the island is circular. It is almost uninhabited, about 15 kilometres in diameter and 1,949 metres high. It last erupted in 1989. This site is off the north-eastern side of the island. An approximate GPS mark for the dive spot is 8° 8' 40.9"S 119° 6' 27.7"E (using WGS84 as the datum). The site is to the west of the GPS mark. 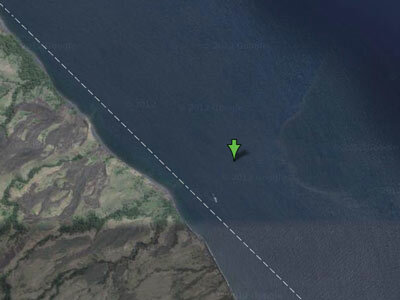 The actual site is located to the north and south of some small rocks/bommies which will be visible from the GPS mark. The best place to start is to the south of the rocks. As with virtually all dive sites that you do when on MV Mermaid II, you use the RIB (rigid inflatable boat) to get to the start of the dive (and also to get back to the boat). The RIB will drop you normally about 50 metres to the south of the rocks. 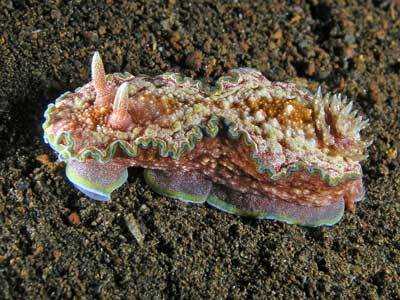 You drop into about eight metres on a black sand bottom. 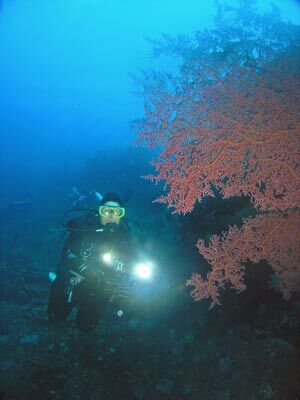 One of the main attractions of this dive site is related to the volcanic origins of this island. As indicated above, the volcano is active, although I do not think it is currently active in the meaning that it is erupting. As you drop to the bottom you will see bubbles rising from the sand. The bubbles are from the volcano, probably sulphurous in nature. More about this shortly. The bottom goes from three to five metres at the top (a few metres off shore) down to about 30 metres. 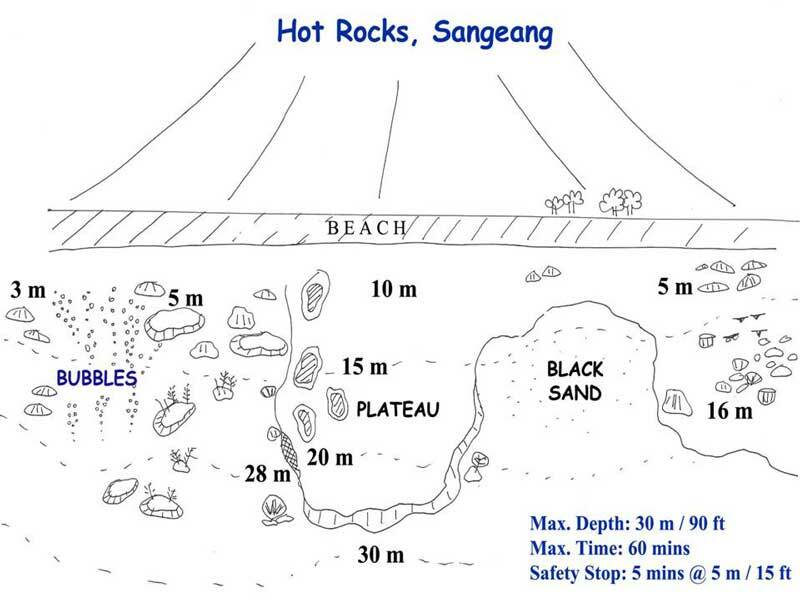 Where you drop in is mostly sand, with some isolated coral bommies. As mentioned, there are bubbles rising up all over the place. If you go to the bottom and stick your hand in the sand, you will find that the sand can be very warm. This is not true for all the sand, but try doing this wherever you see bubbles exiting from the sand. 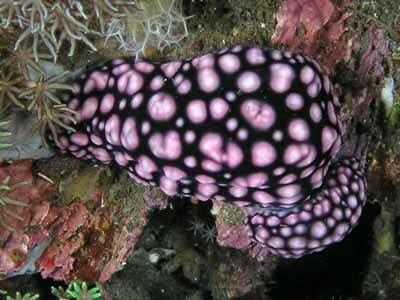 After looking at this phenomena, head a bit deeper and towards the north and you will hit a coral reef. This has some very nice walls, a few overhangs and swim-throughs. 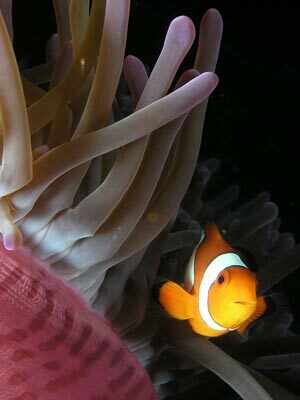 In among the coral bommies on the main reef we see a couple of leaf fish. 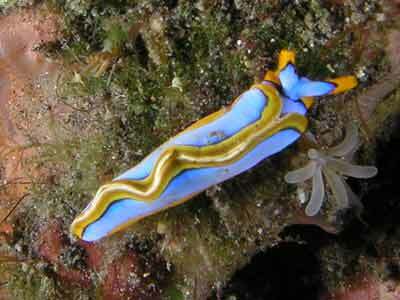 These small (150 mm long) fish just sit on the bottom and rock in the surge. They are a brilliant fish, a bit like a smaller version of the red indianfish that we get in Sydney and New South Wales. 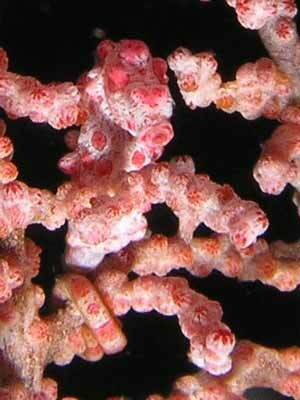 On the main wall there are large gorgonias, sea whips and hard and soft corals. 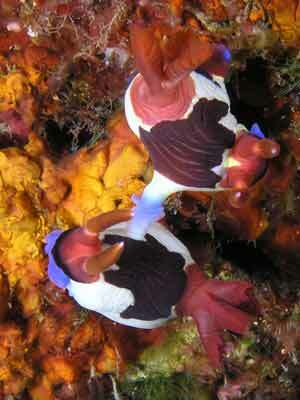 There are small gobies on the sea whips, hard to see and even harder to photograph. 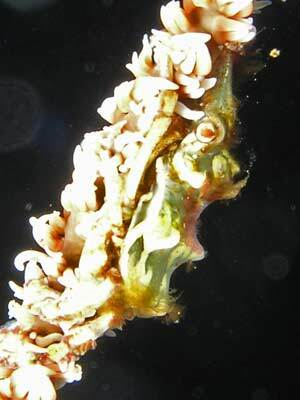 We also see spindle cowries, many different shrimp and almost a dozen different species of nudibranchs. There are a few different species of larger fish, snapper, banded sweetlips and more. We also see emperor angelfish. After 25 minutes here we hear a huge metallic sounding explosion. It totally rocks us, my chest feels as if it has been thumped. What the hell was that? I watch the RIB that is above us and it does not seem to react. I therefore make the assumption that whatever it was it was underwater. It turns out that it was dynamite fishers. I have heard this before in Chuuk Lagoon, but it was nowhere near as loud as this. It must have been a huge explosion as the people on the boat report that they saw no-one nearby. Later dozens of dead fish drift past the boat. Terrible! 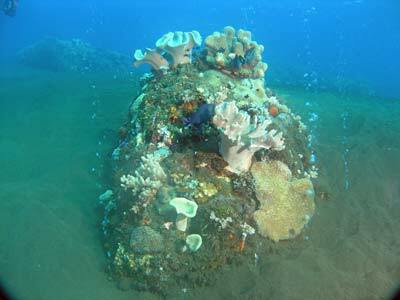 We explore the main part of the reef, getting to about 28 metres. 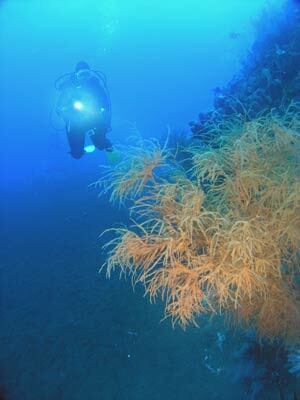 We spend most of the dive in the area shallower than 18 metres. There is so much to see, we end up doing almost 80 minutes before surfacing. While doing our safety stop I follow our guide who has surfaced. I stay underwater and pass over the gap between the rocks to the northern side of the dive site and see some of our other divers exploring this section of the reef. They report that this section was also very good. This was an excellent dive site, marred a little by the explosion and subsequent mass killing of fish. The visibility was probably 30 metres and the water temperature was about 27°C. Click here to return to see the dive profile from my computer.